So Mercedes-Benz Fashion Week Spring 2014 will be my 19th season of attending fashion week, but marks my 14th season of actually covering the shows. Of all the fashion week seasons, this is the first time I actually feel prepared to cover fashion shows and lounges with the proper tech accessories! This season I'm not worried about running out of memory card space for my DSLR camera, my iPhone dying on me or losing or misplacing my phone. I usually attend 30+ shows each season, and between 6-12 VIP/media lounges, which translates to a lot of long hours posting to social media, checking email and taking pictures/video with my iPhone and DSLR camera. 1. Eye-Fi Mobi memory card instantly delivers photos and videos from your camera to your smartphone or tablet. Mobi creates its own WiFi so you can transfer photos and videos anytime, anywhere. To transfer files, you just install the Eye-Fi app on your smartphone or tablet and connect the card. I'll be able to access images I take with my DSLR camera and post to Facebook/Twitter/Instagram with my iPhone. Eye-Fi Mobi memory cards are available as 8GB ($49.99), 16GB ($79.99) and Pro X2 16GB ($99.99). 2. Kingston's Mobility Kit ($28.79 at Staples) allows you to convert the microSDHC card into an SD or USB drive, giving mobile users versatile storage across multiple digital devices, from cameras and computers to smartphones and tablets. I'll have no problem getting through the week with my Class 10, 32GB card. I plan on using it primarily for my DSLR camera but I love the convertibility option if needed. 3. iFi Smart Tag for iOS ($29.95) - bluetooth device that can be attached to your keys or purse. It connects to your smartphone and alerts you when you are about to leave something behind. An alarm goes off when Smart Tag and your phone get separated. You can even setup email notifications with Google Map showing the exact location of your missing item. The iFi Smart Tag will be helpful in tracking my phone, especially when I misplace it at home or somewhere in my purse. I can also use the iFi Smart Tag app to find my keys when I misplace them. 4. myCharge Freedom 2000 ($79.99) - sleek and stylish iPhone 5 case charger, available in silver or black, with up to 110% extra battery life (2000mAh), pre-charged and ready to use! The one-piece protective case has a rubber outer layer for maximum protection and can easily pop on or off. The powercase also features a built-in charging cable to easily plug into the phone when a charge is needed. 6. 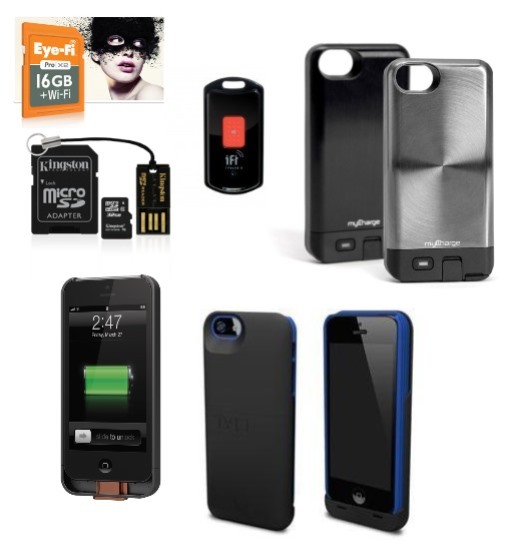 TYLT ENERGI Power Case ($99.99) for the iPhone 5 has a built-in battery (2500mAh), which doubles your standard battery life. It comes with two slim-line protective accent cases - the blue + black combo is my favorite but also is available in green + black and red + black. The stylish case easily slides out of the exterior charging case.